Despite the War Museum’s best intentions, POGO remained stored in its damaged condition at Vimy House (the museum’s annex) and was not displayed in any exhibition. In 2003, the Museum reviewed its collections in preparation for the move to its new location on Booth Street, Ottawa and concluded that POGO should no longer be retained because she was never involved in an armed conflict. As a result of this decision, the National Office of the Navy League of Canada was then contacted to determine if it had any interest in acquiring POGO for its Royal Canadian Sea Cadets. 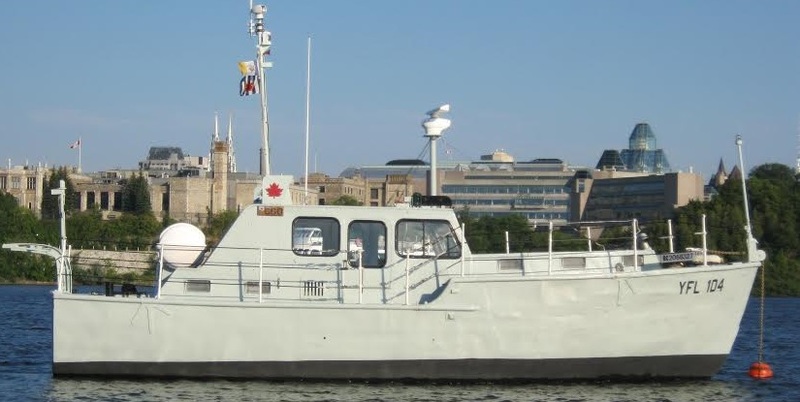 Fortunately, the Navy League recognized POGO’s tremendous potential for the cadets and immediately identified the Outaouais Branch as the most likely group to succeed in revitalizing her because of its experience with the operation and maintenance of two motorized 27 ft training boats since 1995. The Branch enthusiastically agreed to accept POGO in its inventory but, because of the additional responsibility involved, decided to create the Maritime Affairs Committee. This financially independent committee ensures that funds collected for regular cadet activities cannot be redirected to refurbishing and maintaining the training boats. At the beginning of 2005, preparations were undertaken to remove POGO from Vimy House. The Centre de formation professionnelle de l’Outaouais (CFP) became a major partner in this endeavour by agreeing to construct a steel cradle for transporting and storing purposes. The CFP further agreed to provide temporary housing for POGO and to use her as at teaching aid for its students from various disciplines. In Spring 2005, the War Museum transferred ownership to the Outaouais Branch of the Navy League of Canada. The Maritime Affairs Committee took charge of POGO and organized its move to the CFP. In the two years that followed, students from several departments, including welding, diesel mechanics, electricity, machining and building maintenance carried out several tests and repairs. In Fall 2007, POGO was moved from the CFP to the only marina in the Outaouais equipped with a travel lift capable of transporting her in and out of water. From 2007 to 2009, volunteers from the Maritime Affairs Committee continued working on the boat and enlisted the support of the CÉGEP de l’Outaouais whose Administration students developed various marketing strategies. On September 13, 2009, POGO finally sailed up the Ottawa River on a trial basis, escorted by two cadet training boats, the Fred Gordon and the John Boucher. She proved to be in remarkable water-tight and mechanical condition despite her many years of inactivity. Upon arrival in Hull, our long time partner, the Club de Yachting Portage Champlain greeted her with enthusiasm and provided high visibility docking until the end of the boating season. She then made the return trip down river to her winter storage facilities. During Winter 2009-2010 the Committee created an Internet site (www.affairesmaritimes.org) to promote POGO and facilitate fund-raising for her restoration. A promotional pamphlet was also completed and POGO’s history was published in two parts in the December 2009 and May 2010 issues of Soundings, the periodical of the Ottawa chapter of the Naval Officers Association of Canada (www.noac.ottawa.on.ca/). On the international scene POGO was welcomed into the fleet of the prestigious US based Historic Naval Ships Association (HNSA) (www.hnsa.org/). She now shares an enviable place alongside other Canadian historical ships such as HMCS Haida and HMCS Sackville. In Summer 2010, she was invited to participate in the prestigious Montreal Classic Boat Festival (www.fbcmontreal.com/) where she attracted the attention of many visitors and pleasure craft enthusiasts. The 200 mile round trip from Gatineau posed a formidable challenge for this 56 year old boat with bare-bone equipment, 15 year old fuel, and a maximum of 5 hours trial time on the water. To add to this challenge, she was made to tow a 9,000 lb safety boat. She lived up to expectations and showed no weakness throughout the trip. POGO has since attracted the interest of several sea cadet corps in the National Capital area and the naval reserve has expressed an interest in her training potential for its personnel. A request for service was even received from Canada's Chief of the Defence Staff. In November 2010 she also became well-known to Gatineau elected officials through a very successful fund raising ceremony at City Hall in the context of the Canadian Naval Centennial. In January 2011, the HNSA’s publication - Anchor Watch - dedicated a full page to our tough little boat. The write-up was later reprinted in the home page of the Navy League’s web site. In February 2011 the City of Gatineau recognized the potential contribution of the POGO for recreation, sports and community development and provided a grant to help in her refit. The summer of 2011 was dedicated to obtaining some state of the art navigational equipment and to demonstrating POGO’s reliability to the high ranking officers of the Navy League of Canada. She was again invited to participate in the Montreal Classic Boat Festival (MCBF) and, in addition, to visit the Sea Cadet National Regattas at the Royal Military College in Kingston (Ontario) which took place a few days later. Such a trip required a 700 km trek down the Ottawa River to Montreal, up the St-Lawrence Seaway to Kingston and down the entire Rideau System back to Gatineau. At the MCBF, POGO’s crew was responsible for “Présence” -an exhibit of the Naval Museum of Québec and also welcomed several visitors aboard. At the National Sea Cadet Regattas, POGO dedicated a whole day to accompanying Navy League dignitaries and several parents to the competition site to better observe the various manoeuvres. Three foot waves allowed our guests to appreciate the boat’s stability as well as her ability to repel spray. POGO performed without a glitch during the entire 12 day trip. Her volunteer crew also seized the opportunity to complete the installation of the $20,000 worth of equipment that had been secured at the beginning of the season. POGO is now equipped with an NMEA2000 network linking all its electronic components. In the Summer of 2012, Pogo participated in two major events, i.e, the Rideau Canal Festival in Ottawa and the National Sea Cadet Regattas in Kingston. The festival provided her with high visibility and allowed her to greet several visitors; she was also awarded 2nd prize in the Parade of lights. In Kingston, she performed all week as the regatta committee boat where she received very favourable comments from organizers and participants alike. Our volunteers once again took advantage of the six day trip to install new equipment purchased with the help of a financial contribution from the City of Gatineau. Volunteers are hard at work rendering POGO fully operational and preserving her heritage value. She is now providing sea cadets in the National Capital Area with an opportunity to put their classroom notions into practice. In her off-time, she could enhance the practical skills of new boat owners or accommodate other youth organizations interested in nautical activities - on a cost recovery basis. Maritime Affairs Committee volunteers are seeking the necessary material and financial assistance to allow them to meet their objectives and to remind Canadians of POGO’s contribution to our country’s sovereignty in the Arctic. If you wish to donate on-line you can visit our web site at www.affairesmaritimes.org. If you wish to contribute equipment or book a visit this summer, you can contact us at info@affairesmaritimes.org.